The largest gathering of professionals from the performing arts in Ireland and Northern Ireland takes place in Cork this year. 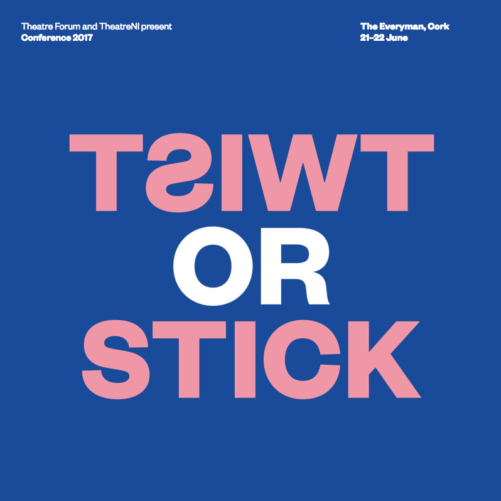 Built around a call to action, Twist or Stick, a programme of speakers, panel discussions and debates explore how the wider performing arts sector negotiates with a rapidly changing economic, social and political environment. We are constantly responding to change in our communities, trying to protect independence, originality and livelihoods while also recognising artists are changing how they work. In navigating a relevant and exciting future for the performing arts, practitioners, artists, venues, festivals, companies and public bodies have choices: to change or to stay the same; to do something or to do nothing; to decide what to get rid of and what to protect. Riffing on card games, this rapid fire two-day programme asks how we will play the hand we have been dealt. Early Bird Member Tickets are on offer to Theatre Forum and TheatreNI members until 14 May. (Note your membership must be paid for 2017 to avail of the member rates). Your conference ticket covers access to all conference sessions, lunch on both days as well as the Wednesday evening programme, including dinner. No booking fee applies and remember you don’t need a Paypal account. *Sterling prices are approximate only and the exchange rate at the time of PayPal purchase will apply.